Ellen gets a big shock when her reflection climbs out of a mirror. But Mirror-Belle is a double with a difference! She is a princess, and a very mischievous one at that. Join Mirror-Belle as she sweeps Ellen into hilarious Christmassy escapades – from joining in with the Christmas ballet show to attending Ellen’s friend’s fancy dress party and trying to catch Father Christmas! You can always guarantee that wherever Mirror-Belle goes, trouble will follow. This special hardback edition contains two seasonal MirrorBelle stories, colourfully illustrated by Lydia Monks, plus some festive things to make and do. 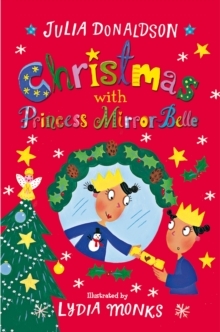 Christmas with Princess Mirror-Belle is perfect for reading-aloud or for beginning independent readers.